Arlene, the Rebel Queen was recently included in the Bank Street College of Education’s annual list of the best children’s books. The Children’s Book Committee’s 2014 list included Arlene in the ages 9-12 category and marked it as a great read-aloud choice for teachers and parents. Bank Street College of Education strives to guide librarians, educators, parents, grandparents, and other interested adults to the best books for children published each year. In choosing books for the annual list, reviewers consider literary quality and excellence of presentation as well as the potential emotional impact of the books on young readers. Other criteria include credibility of characterization and plot, authenticity of time and place, age suitability, positive treatment of ethnic and religious differences, and the absence of stereotypes. Bank Street College is a leader in the field of education. Its programs include a graduate school of education, a premiere independent school for children, a head start program, and a family service center. Bank Street is unique in that it melds the clinically grounded knowledge of professionals with the theoretical abstract world of the researcher, and then tests that theory in practice and that practice in theory. We are proud to be endorsed by such a prestigious institution! Both Arlene On the Scene and Arlene, the Rebel Queen have been officially leveled! We have always envisioned both books to be a valuable addition to the language arts curriculum. Thus we knew it was important to have them assessed using the F&P Text Level Gradient™ Leveling System developed by Irene Fountas and Gay Su Pinnell. This comprehensive leveling system is used by major publishers of materials for schools, including Scholastic, Houghton Mifflin and McGraw Hill. The levels in the F&P Text Level Gradient™ are based on ten text factors including Genre/Form, Text Structure, Content, Themes and Ideas, Language and Literary, Features, Sentence Complexity, Vocabulary, Words, Illustrations, and Book and Print Features. With this leveling assessment, educators can be confident that the books are appropriate for their students for guided reading lessons, such as the detailed lessons provided in our Revised Teacher’s Guide. It is an essential part of the Common Core State Standards for educators to provide texts of increasing complexity and to utilize guided reading to improve comprehension and critical reading skills. Arlene On the Scene was assessed at a Level P, and Arlene, the Rebel Queen was assessed at a Level Q. A guide as to how these levels correspond to grade levels can be found in the F&P Text Level Ladder of Progress. We also recognize that both parents and teachers may need a sense of where these books fall as an independent reading choice. Thus we had our books assessed by Metametrics®. Their Lexile® Framework for Reading evaluates reading ability and text complexity on the same developmental scale and is the industry standard for matching readers to texts. Arlene On the Scene was measured at 730L and Arlene, the Rebel Queen was measured at 750L. We hope that these assessments assist parents and educators in choosing our books for home and classroom libraries. As always, don’t hesitate to contact us if you would like more information about our books and free school presentations. Forty-six schools, eight states, 6600 students. The third year of the Hereditary Neuropathy Foundation’s School Outreach Program was our best yet! From our home state of Rhode Island, to our current homes in New York and Washington, DC, and on out to Chicago and Dallas, we met our goal of reaching more students, teachers and parents than ever. Our school presentations deepen understanding of disability as difference, something that can be embraced rather than merely tolerated or accepted. With our sequel, Arlene, the Rebel Queen, we added the powerful message that every young person has the potential to change the world. In fact, perhaps the young are best suited to lead us to change! With the addition of our Team CMT Kids program, we provide the opportunity for students to join with us in our mission to one day cure Charcot-Marie-Tooth (CMT). Be sure to check out our new video of highlights from this year’s presentation. Having presented at almost 100 schools since first writing Arlene on the Scene, educators are beginning to spread the word on the classroom potential for the Arlene series. We’ve received positive reviews from the School Library Journal, our Teacher’s Guide for Arlene On the Scene has been revised, and many schools have taken advantage of discounted class sets. Both books will also be assessed this summer for their reading levels. We believe that awareness is an integral part of HNF’s mission to support those living with CMT. We have found that our children’s books and accompanying school presentations have resulted in increased understanding and support for our friends and family members living with CMT, as well as all of those we know who live with all kinds of disabilities and differences. That would include just about all of us! We look forward to next year, increasing our reach even further. Don’t forget to contact us if you’re interested in a free school presentation in your area. It’s here, our REVISED Teacher’s Guide! Many teachers have found our Teacher’s Guide helpful to incorporate Arlene On the Scene into their language arts curriculum, from grades three to five. Some have asked us whether more printable worksheets were available–now they are! In addition, many have pointed out that the activities and worksheets in the Guide naturally align with a wide range of Common Core State Standards for English Language Arts. We thought it made sense to include these standards within the Guide as well. Check it out, let us know what you think! Team CMT Kids Goes the Distance! The biggest Team CMT Kids event of the year featured a group of youth triathletes going the distance to support those who live with Charcot-Marie-Tooth disease. The Playtri Youth and Junior Teams of Dallas, TX are incredible athletes! At the Hidden Cove Youth Triathlon meet last week, these kids, ranging in age from eight to fifteen, jumped into frigid lake water in the early morn for a challenging swim, then hopped on their bikes for a few laps around the park, rounding it all out with a run to the finish line–no, make that sprint to the finish line. Yes, they had enough energy left to burst through that inflated arch, shaving precious seconds off their total time. What made it all so moving was knowing that these kids had chosen to support those living with Charcot-Marie-Tooth disease at this event. The team read the book Arlene On the Scene earlier in the year and had learned about the challenges of those living with CMT. They then set out to raise money in the weeks leading up to their first big team competition of the season. Through their efforts and dedication, the Playtri team raised $1275 for the cause! This money will be donated to the Hereditary Neuropathy Foundation to support their efforts to find treatments and a cure for CMT. We also presented at elementary schools in Dallas in the days before the triathlon event. Seven schools received free author visits, and about 1200 students learned about empathy, disability, and CMT through a discussion of the Arlene books, along with a reminder of the power of writing! Cesar Chavez Learning Academy, Sam Houston Elementary, Truett Elementary, Mark Twain, M.T. Reilly, and Central Elementary all participated in these lively discussions. Titche Elementary even blogged about it! As most who’ve read these books know, Carol grew up in Rhode Island and is an East Coast gal. But Dallas folks sure are friendly! Students asked amazing questions and had great insight into the social issues discussed at the presentations. Thank you to all the media specialists who opened their doors to our School Outreach Program! We’ll be coming back to “the DFW” next year for sure! Thank you again to the Playtri team and Coach Morgan Johnson! We couldn’t accomplish our mission without your support! Kizirian Elementary School in Providence, RI has found Arlene On the Scene to be a great teaching tool in many areas. Bonus: it’s a fun read! After purchasing a copy for all of the third graders, Kizirian Elementary dove right in. Using our free Teacher’s Guide and graphic organizers, students learned about disability and Charcot-Marie-Tooth disease, as well as broader topics such as the power of empathy and the beauty in embracing differences. Kids created their own campaign signs and even made their own Plumpy the Pumpkin! They also used worksheets from the Teacher’s Guide to explore their own character and that of their peers. They practiced avoiding judgments based on outside appearances and using their empathy skills to support one another. Finally, for Character Day, students dressed up like their favorite characters from Arlene On the Scene and Arlene, the Rebel Queen! Kizirian Elementary students, you are a shining example of the power of empathy! You are awesome! Arlene has been on the road again! We visited fourteen schools in our home state of Rhode Island in early April. Wow, was it good to go home again! I even went to my alma mater, Sherman School. And there was that red bench, the one Arlene sits on near the end of Rebel Queen when she has a heart-to-heart with Mr. Musgrove. While the bench has been painted, and the seats in the auditorium are now cushioned (cushions! I had to sit on hard wood, for hours, with no bathroom breaks…), my former school has the same warm feel, the same welcoming vibe. We simply had a great time in Rhode Island! From Narragansett to Quidnessett, Coventry to Providence, Warwick to Johnston, we met amazing students at every school. We even ventured into southern Massachusetts, to Braintree and Arlington. Students at every school jumped into a great discussion of empathy, self-image, and the power of activism. Through these conversations, and an amazing video of eight year old Jennifer Keelan climbing the steps of the US Capitol, we learned that one person, one kid, can indeed change the world! We spent some extra time with kids at Kizirian Elementary in Providence–they had great questions! Hope their biographies are coming along. 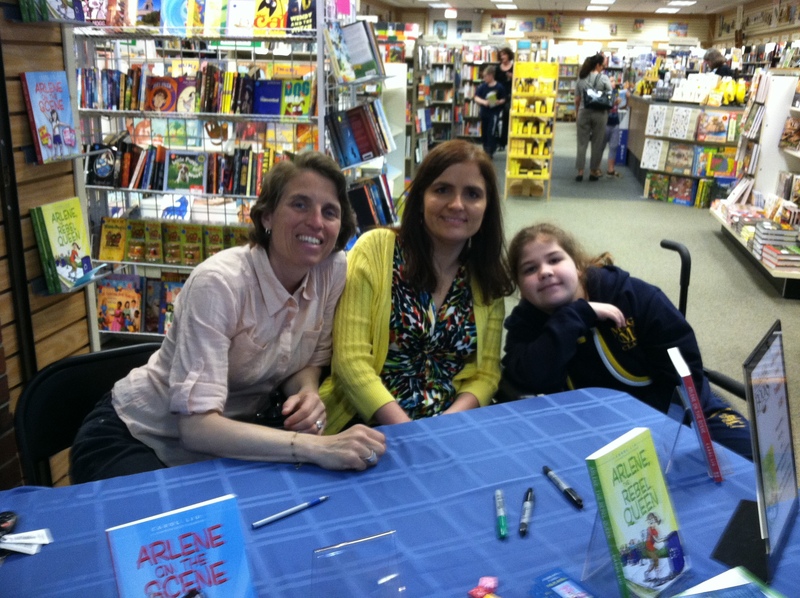 We also want to send a big thank you to Wakefield Books for hosting a book signing with Grace and Marybeth! We also just got back from Illinois–Naperville to be exact, just outside of Chicago. What a great town, great kids! And I had the pleasure of meeting in person a wonderful teacher I’ve heard about for years, my husband’s fourth grade teacher from Madison, NJ. There she is, still in the classroom, still inspiring young minds. Her second graders had just finished reading Arlene On the Scene and had many insightful questions and responses. At every school, students and teachers learn about Charcot-Marie-Tooth disease and the challenges our friends and families face each day. They begin to understand why the mission of the Hereditary Neuropathy Foundation is so important. More broadly, we highlight the power of empathy and the beauty in not accepting, not tolerating, but embracing differences. Still left on the schedule this year: New York, Philadelphia, and Dallas. Be sure to let us know if you’re interested in a free author presentation! Details can be found on our program brochure, and you can email us any time for more information!